A baby's first Xmas is special and these cards make beautiful keepsakes for the new parents. Whether you are the proud new grandparent or the new mum and dad, these lovely cards will be sure to delight. Matching keepsake boxes and photo albums can also be made to order. 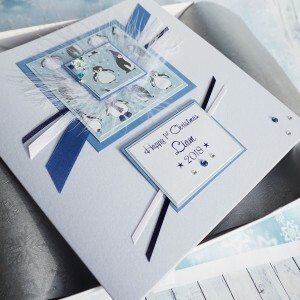 Luxury Boxed Christmas Card "Frosty"
Handmade Boxed Christmas Card "Frosty" A luxurious card personalised for someone speci.. 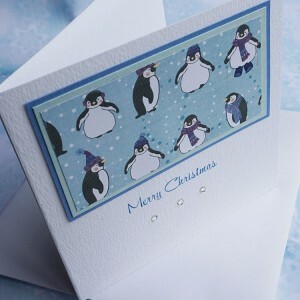 Luxury Boxed Christmas Card "Playful Penguins"
Personalised Boxed Handmade Christmas Card "Playful Penguins" perfect for Baby's First Chris.. 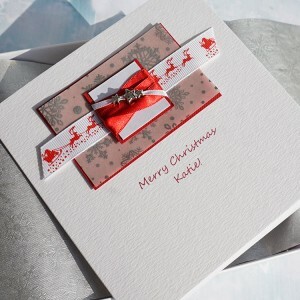 Luxury Boxed Christmas Card "Sleigh Bells"
Personalised Handmade Boxed Christmas Card "Sleigh Bells " for son, dad, daughter, gran, gra..